This week’s blog is a comprehensive how-to guide to thieving. Nah, just playin. Over the weekend, my bag was stolen. It was somewhat my fault, but it was stolen and I don’t have it any longer. Inside were a couple of odds and ends: running gear, keys, bamboo utensils, cotton bulk bags, a glass container with nachos in it, my book, headphones, etc. Other than the minor inconveniences associated with losing some of my belongings, I’m not upset about losing the bag and paraphernalia, as there ain’t a darn thing I can do about it now. However, since Friday, when I lost the bag, I have been able to learn something from the experience. I’d like to share this with you. My knee-jerk reaction after giving up hope of seeing the bag again was to replace the bag and its contents. I used the bag and contents for work, play, errands, travel, and more. The bag and its contents were on my back every day, so they were absolutely necessary. Or were they? What has occurred since its disappearance is an opportunity to assess the necessity of the bag and its inhabitants. This was an opportunity to practice the minimalist ideals towards which I strive. This theft also comes at a time when I have been reading and therefore paying particular attention to, the philosophy of stoicism. 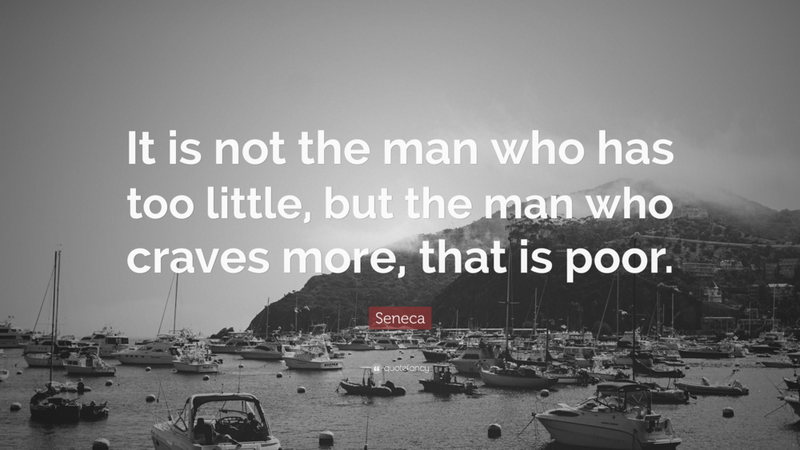 In both the ever-evolving, but well-refined, tradition of stoic thought and today’s related notions of the merits of living minimally, there is a strong focus on having and using only what one needs. That is, the stoic achieves tranquility and fortitude through indulging in only what is required, and the minimalist frees her mind through ridding her life of the superfluous. Philosophy...quotations...Seneca...jeeeez, I really go off the hinge on these blogs, don’t I? I’m starting to sound dangerously righteous in just the perfectly Los Angeles manner. Forgive me. Anyways, losing the bag presented an opportunity to assess my belongings. For example, about 30 seconds after losing the bag it was clear that my running shoes needed replacing, but the shirt, shorts, and socks could possibly go unreplaced. About 31 seconds after losing the bag I realized that I needed to buy more bamboo cutlery, as I use them incessantly. On the other hand, I have two other sizes of the cloth bag I keep them in which doubles as a bulk bag - so maybe that needn’t be replaced. It might be a bit large to put beans, grains, and utensils in, but I can just fold it. Am I really such a lousy minimalist that I would buy another bulk bag owing only to its size being perfectly suited to my use for it? Surely I can still put my coffee beans in the larger bag and stuff the extra cloth aside. Headphones. Instead of rushing out to buy a new pair, because music is life, I restrained myself and asked me mum if she had an extra pair lying around the house. Of course, she did. Environmental success - not buying anew when a pair lies unused in a drawer somewhere. As for the bag itself, I have been using a less capacious, less ideal messenger bag in hopes of non-replacement. It remains to be determined if I will choose not to replace the beloved backpack. The point here is not whether I replace all of the stolen items or none of them. The point is that in losing these things, I have created the opportunity to assess whether I need them, and thoughtfully consider their utility. As I'm sure Epictetus, Marcus Aurelius, and Seneca would agree: if you ain’t need that thang, don’t buy it. This, as it happens, is also happens the ecologically considerate choice. The best part is you can have this experience too! All you have to do is go Downtown at night, “hide” your bag in plain sight, and walk away.